Israeli dum dum bullet leads to amputation of the lower leg of a 13 yr old boy. BETHLEHEM (Ma'an) -- Dozens of Palestinians on Saturday attended the "funeral" of a 13-year-old boy's leg that Israeli doctors were forced to amputate after the child was shot and wounded by Israeli forces in September. Issa Ahmad Adnan al-Muti's lower leg was buried in the Shuhada Cemetery in Duheisha refugee camp in southern Bethlehem in a ritual that is commonly practised for amputated limbs. A number of community leaders, including the Mufti of Bethlehem district, Sheikh Abd al-Majid Amarneh, as well as the head of the Palestinian Authority Committee for Prisoners' Affairs, Issa Qaraqe, attended the ceremony. Al-Muti’s foot was buried under an olive tree with a grave stone bearing a picture of the child. Al-Muti was shot and injured by Israeli soldiers on Sept. 18 during a protest in northern Bethlehem -- reportedly with a "dum-dum" bullet, which expands inside the body on impact. 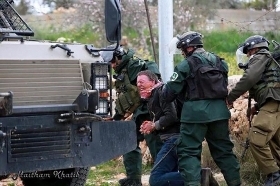 He was taken to an Israeli hospital under military custody, although the army later agreed to release him on a bail of 2,500 shekels ($650). He is still being treated in Israel's Hadassah hospital. The Israeli army said he was shot and detained for throwing stones, but his lawyer said the 13-year-old was helping to take his brother to a nearby hospital when he was hit by the bullet. During the "funeral" of the boy's leg, Qaraqe called for an end to Israel's "policy of executions, premeditated murder, and opening live fire on our children and youth." He said that al-Muti's injury, as well as injuries suffered by hundreds of other Palestinian children was "a war crime committed by the Israeli government under an official Israeli order." The Israeli army has come under repeated criticism for violence toward children. The use of "dum-dum" bullets constitutes a war crime under international law, but rights group Defense for Children International has reported a number of instances where the bullets have been used by Israeli forces.